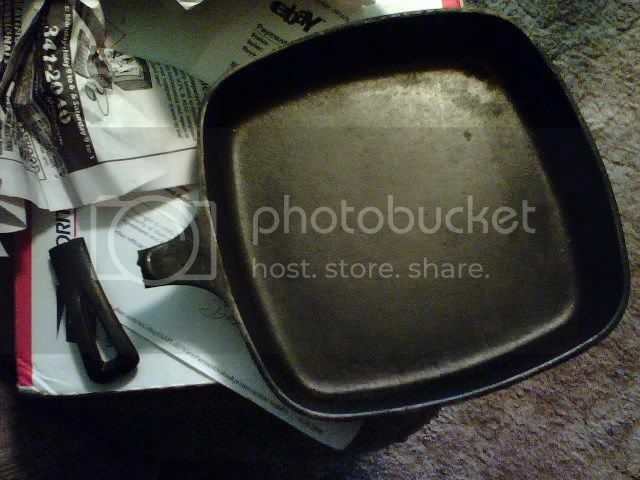 Some people believe cast iron is steel and unbreakable. 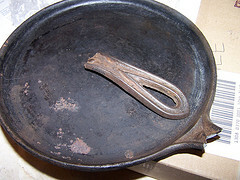 Cast iron is very brittle, one of the properties which make it so hard. It is much like glass, which is also very hard and brittle. The weight of the items makes them even more susceptible to damage if they are not packed tightly, and allowed to move around in the shipping box. One common result of this is having the handle of a skillet poke out through the side of the box. This usually leads to damage. If a package won't survive a trip down the basement stairs, it won't survive the USPS sorting facilities. Picture a dumpster full of boxes, lifted and dumped into a larger dumpster full of boxes, then poured out onto a conveyor, and then it all gets reversed at the destination sorting facility. On the WAGS forum, there has been a lot of talk/discussion about the way some Ebay sellers don't listen to buyers in the shipping and packing of items. Some of our members are sellers and point to buyers who request the cheapest method of shipping possible as being part of the problem. The result is that the items are coming in broken and the loss is tragic. While there are SOME cases where the fault is with the shippers for breaking the items with rough handling. MOST of the time there would have been no damage had the item been properly packed. Buyers need to understand that good packing is well worth paying extra for. Proper packing benefits both buyer and seller. Nothing looks better in your feedback than numerous comments complimenting your quality of packing. Experienced collectors will routinely disregard auctions if the feedback has negative comments on packing, and reports of damaged items. Insurance is one way for sellers to cover themselves from responsibility, but most insurance will not cover damage caused by improper packing. With Ebay's new policies, the seller is responsible to ensure the safe delivery of the item. If insurance doesn't pay, the seller has to take the loss. It is always in the best interest of the seller to pack items properly to prevent these losses, as well as to protect their feedback rating. Regardless of the method used, there are a few simple requirements for safe packing. 1. The box must be big enough to allow at least two inches of space between the item and the container on all sides, top and bottom. More is better. No thin cardboard allowed, it must be corrugated. 2. The box must be completely filled and tightly packed with packing material to ensure that the item cannot move around in the box. 3. All seams in the box should be taped with sturdy tape to stiffen the box and make it stronger. Here's a picture of a GREAT packing job by one of our members. Notice the walls of the box are thick and the CI is wrapped in bubble wrap. It's surrounded on all sides by tightly wadded newsprint that's packed in there rock solid. It would have taken a steamroller to have damaged it. The top layer of tightly wadded newsprint was removed for this photo. Outlined below are several different methods of packing. Buyers can use a link to this page to easily explain to a seller how they would like to have their item shipped by indicating which method they prefer. Also sellers can use this page to communicate to buyers how they intend to pack. Of course people can get very creative when it comes to packing, and these are only a few samples to illustrate some of the more common methods. Packing materials need not be expensive. Many sellers pride themselves on the fact that they use recycled materials. Many buyers prefer this. If you have nothing else on hand, you can pack items safely using only tape and newspaper, or even flyers from the recycle bin of your local post office. This is not as good as bubble wrap, but will do in a pinch. a) Wrap the item in a thick layer of paper, use a whole section of the paper, preferably taped, but this is not critical, just makes it easier to do the next step. b) Put a layer of TIGHTLY wadded paper about 2 inches thick below the item, place the item in the center of the box and surround it on all sides with TIGHTLY wadded paper and seal all seams with tape. Some people are in a position to have on hand, large amounts of bubble wrap. This will work fine as well. a) Wrap the item in a a thick layer of bubble wrap, and tape securely. The tape is not optional here, as the bubble wrap is slippery, and will not stay in place without tape. b) Put a layer of TIGHTLY wadded paper or bubble wrap about 2 inches thick below the item, place the item in the center of the box and surround it on all sides with TIGHTLY wadded paper or bubble wrap and seal all seams with tape. Expensive items, and those where the buyer has payed a premium for Superior packing, double boxed is a great way to protect items. a) Pack item into first box, as above, using bubble wrap, newspaper or a combination of the two.Pack tightly, and seal all seams with tape. b) Pack the first box into a larger box, again as above, pack tightly, and seal all seams with tape. Some sellers are set up to use packing peanuts and find them effective for many items. They are a poor choice for cast iron however. The items are heavy and will settle to the bottom of the box. Once the item is touching, or in some cases even protruding from the side of the box, it has no protection. Loose Foam Peanuts should not be used for packing cast iron. If you must use peanuts, the item is best double boxed, and the peanuts should be crammed in as tightly as possible. The item should also be wrapped, so that fluff from the peanuts is not sticking to the item. Static cling makes it difficult to remove these tiny particles. Some members have had good results with foam peanuts by sealing them into several plastic bags. This prevents them from migrating around in the box. Poking a small hole in the bag allows the air to escape when cramming the package together. You don't want an air-tight bag to pop, and then allow the item to move around. Items with lids or multiple items should be separately wrapped in bubble wrap or a heavy layer of newspaper, use a whole section of the paper for each item. a) Wrap and tape each individual item. b) Tape all of the items securely together. c) Pack this combined item tightly into the box as you would with a single item. 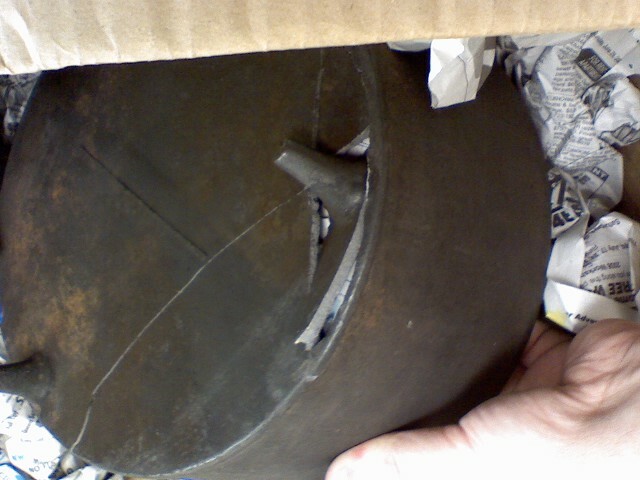 Cast iron is VERY VERY fragile and breaks very easily. Not only are collectors upset that their items have been destroyed, but because, you can't go back and fix these items, you can't replace them and most importantly, this destroys a piece of history FOREVER. Please help preserve our national treasures, our national art, our history and our collections by packing well.